Important Notice: There are now three extra questions involving identification checks. These will appear on all medical questionnaires for pain relief products. Not submitting to these checks will mean that we cannot process your order. 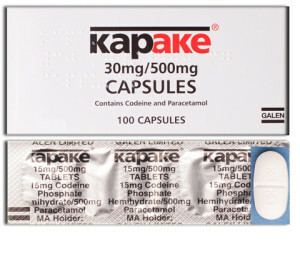 You must agrees to these for us to process your order..
As a brand of co-codamol, Kapake is used to treat moderate pain. It is most effective in those instances where a milder form of pain relief, be it paracetamol or low-strength ibuprofen, may prove insufficient. These instances may have been caused by a surgical procedure, an injury, or be related to an acute or chronic painful condition. This type of medication has also been used to treat fever. This medicine is a compound analgesic, consisting of two main agents. Codeine functions by joining with opioid receptors in the brain, temporarily inhibiting these receptors from receiving and interpreting pain signals sent by the body. Paracetamol is a widely used pain relief treatment that works by desensitising the nerves around the affected area. Codeine is a powerful agent, and as a result, higher strength forms of co-codamol require prior consultation with a doctor. Before you buy Kapake online from us, you will need to complete an online consultation. This is to ensure you are not at an increased risk of suffering from harmful side effects. If you suffer from a certain medical condition, a doctor may choose not to issue this medication to you. In addition, those who are allergic to any containing ingredients should never use it. Possible side effects include nausea, vomiting and withdrawal. For a more comprehensive account of the side effects and restrictions associated with this product, consult the safety information leaflet provided. We ship all of our items via next day tracked courier. If your order reaches our pharmacy before 3pm, it will be shipped on the same day. At all other times, your order will be delivered at the next earliest opportunity. Your safety and privacy are important to us. For this reason, we will only ever ship items in plain, sealed packaging. Note that the 3 p.m. deadline is applicable only on weekdays. When you buy pain medication from our UK pharmacy, you can rest assured you are dealing with a team of professionals who have your safety as their top priority. Once you have selected your product(s) and proceeded to check out, you will be presented with a medical questionnaire. A doctor will then assess your answers. If approved, an electronic prescription will be generated and sent to our dispensing pharmacy on your behalf.